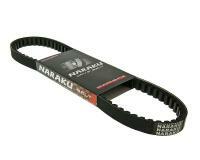 Naraku GY6 50cc Belt 729mm / size 729*18*28 for 139QMB, GY6, QMA 12"
Low-cost, high-quality replacement belt from NARAKU. The belt corresponds to the standards of the original factory-fitted belt. 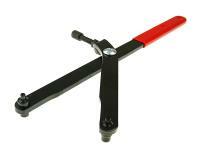 The flexible core of the belt means good flex and low loss of friction. Good grip provides equally good acceleration. A good choice as an original spare and light tuning Suitable for Kymco Fever ZX / KB50 and 139QMB/QMA engines with 12” wheels or original size of the 729-18-30. As a guide, the distance between the crankshaft and the transmission input shaft (this is where the clutch bell sits). This belt is suitable were this measurement is approx. 25 cm Dimensions: 729-18-28. Please check to make sure you have a 139QMB, 139QMA, GY6 50cc engine before ordering. Please double check your original belt measurement. Naraku Perfromance Parts for Scooters are known for producing high quality supplies from Taiwan. Having over 10 years experience they are known for delivering superb quality parts for mopeds and scooters to some of the best known race teams. Naraku product range consists of cylinders, cylinders head comp, pistons, drive belts, variators, cdi units and accessories. The replacement Naraku performance belts range has our highest recommendation. Please check your model and brand on the applications tab as well as the picture prior to ordering to make sure you are getting the correct Naraku Scooter Part. If you have a question on a Naraku part for a scooter, supermotard, enduro, dirtbike, moped, motorbike, ATV or UTV please open a support ticket and we will respond promptly.